mostly 2-5 mm in apparent diameter, in a fine-grained matrix which also contains smaller (<2 mm), angular metal shards. Material from Eric Twelker, Meteorite Market. The Gujba meteorite is classified as a bencubbinite (class CBa). Gujba should be compared with the Bencubbin meteorite, a 1930 find in Australia. The Gujba meteorite is a Bencubbin-like stone with abundant metal nodules, which fell in Nigeria on 03 April 1984 (Grossman and Zipfel, 2001). The fall site, in corn fields near the village of Bogga Dingare, lies W.S.W. of the city of Maiduguri (the fall and early research is described by Ostaficzuk, 2009). Total known weight is on the order of 100 kg. The volume of research accelerated rapidly following dissemination of material circa 2001. Gujba (aka "Guizba") shares abundant metal and dark matrix with four other kindred meteorites, including Bencubbin and Hamada al Hamra (HaH) 237 (compare photos in Haag, 2003). Gujba now figures in numerous reviews and catalogues of meteorites (e.g., Haag, 2003; Krot et al., 2005; Osawa et al., 2005; Caillet Komorowski, 2006; Norton and Chitwood, 2008; Scott, 2011). The bencubbinites and other grouplets of carbonaceous chondrite affinity are reviewed by Krot et al. (2002). Chondrules and metal grains are discussed by Rubin et al. (2003), Whitby et al. (2003), Krot et al. (2004) and Gilmour et al. (2009). 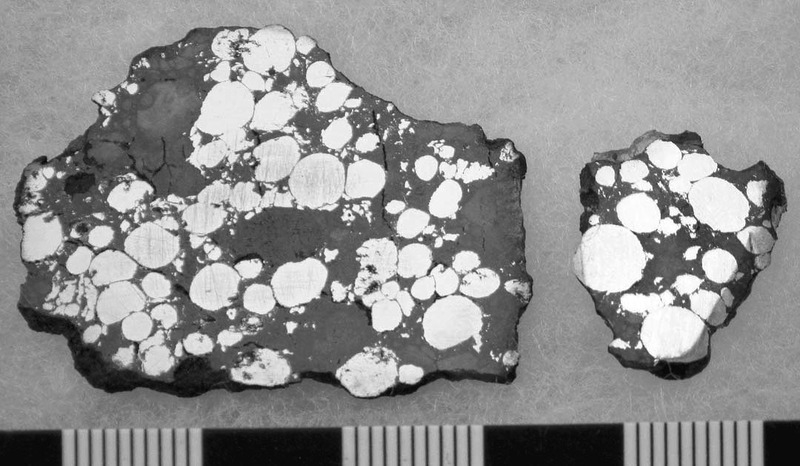 Gujba chondrules tend to be complete spheres, whereas those in Bencubbin and Weatherford are often deformed and broken. The CB meteorite chondrules are all free of metal and sulphide phases. Gujba chondrules display exclusively skeletal olivine crystals, with forsteritic olivine (Fa1-4), low- and high-calcium pyroxenes and glassy mesostasis. Textural and chemical contrasts to chondrules in CBb meteorites like HaH 237 suggest that the CBa chondrules may have been formed in a late shock (impact) event which reprocessed CBa material (Krot et al., 2004). Much of the work on bencubbinites has focused on the metal, which may have formed by condensation of a metal-enriched gas formed by protoplanetary impact involving a metal-rich body (Campbell et al., 2002; Cook et al., 2005, 2007). There are now six identified bencubbinites, the small NWA 1814 included (Perron and Leroux, 2004). NWA 1814 contains ~60 volume percent metal clasts, in a shock-melted matrix of metal and silicate. It is a CBa chondrite, a 156-gram stone purchased in Morocco, and said to have been found in April 1999. Gujba itself is now classed as a CBa carbonaceous chondrite, of petrologic grade 3. Caillet Komorowski,CLV (2006) The meteorite collection of the National Museum of Natural History in Paris, France. In `The History of Meteoritics and Key Meteorite Collections: Fireballs, Falls and Finds' (McCall,GJH, Bowden,AJ and Howarth,RJ editors), Geol.Soc. Spec.Publ. 256, 513pp., 163-204. Campbell,AJ, Humayun,M and Weisberg,MK (2002) Siderophile element constraints on the formation of metal in the metal-rich chondrites Bencubbin, Weatherford, and Gujba. Geochim.Cosmochim.Acta 66, 647-660. Cook,DL, Wadhwa,M, Clayton,RN, Dauphas,N, Janney,PE and Davis,AM (2007) Mass-dependent fractionation of nickel isotopes in meteoritic metal. Meteoritics & Planetary Science 42, 2067-2077. Cook,DL, Wadhwa,M, Clayton,RN, Janney,PE, Dauphas,N and Davis,AM (2005) Nickel isotopic composition of meteoritic metal: implications for the initial 60Fe/56Fe ratio in the early solar system. Meteoritics & Planetary Science 40, A33. Gilmour,JD, Crowther,SA, Busfield,A, Holland,G and Whitby,JA (2009) An early I-Xe age for CB chondrite chondrule formation, and a re-evaluation of the closure age of Shallowater enstatite. Meteoritics & Planetary Science 44, 573-579. Grossman,JN and Zipfel,J (2001) The Meteoritical Bulletin, No.85, 2001 September. Meteoritics & Planetary Science 36 no.9, A293-322. Haag,R (2003) The Robert Haag Collection of Meteorites. Robert Haag Meteorites, Tucson, AZ, private collection edition, 126pp., pp.83-84. Krot,AN, Amelin,Y, Russell,SS and Twelker,E (2004) Are chondrules in the CB carbonaceous chondrite Gujba primary (nebular) or secondary (asteroidal)? Meteoritics & Planetary Science 39, A56. Krot,AN, Keil,K, Goodrich,CA, Scott,ERD and Weisberg,MK (2005) Classification of meteorites. In `Meteorites, Comets, and Planets' (Davis,AM editor). Treatise on Geochemistry volume 1 (Holland,HD and Turekian,KK editors), Elsevier- Pergamon, Oxford, 737pp., 83-128. Krot,AN, Meibom,A, Weisberg,MK and Keil,K (2002) The CR chondrite clan: implications for early solar system processes. Meteoritics & Planetary Science 37, 1451-1490. Norton,OR and Chitwood,LA (2008) Field Guide to Meteors and Meteorites. Springer-Verlag London Limited, 287pp. Osawa,T, Kagi,H, Nakamura,T and Noguchi,T (2005) Infrared spectroscopic taxonomy for carbonaceous chondrites from speciation of hydrous components. Meteoritics & Planetary Science 40, 71-86. Ostaficzuk,S (2009) The Gujba meteorite - its fall, vagaries, and stardom. Meteorite 15 no.4, 34-38. Perron,C and Leroux,H (2004) Fe-Ni metal in NWA 1814, the sixth Bencubbin-like meteorite: properties and origin. Meteoritics & Planetary Science 39, A82. Rubin,AE, Kallemeyn,GW, Wasson,JT, Clayton,RN, Mayeda,TK, Grady,M, Verchovsky,AB, Eugster,O and Lorenzetti,S (2003) Formation of metal and silicate globules in Gujba: a new Bencubbin-like meteorite fall. Geochim.Cosmochim.Acta 67, 3283-3298. Holland,G, Busfield,A and Gilmour,JD (2003) Gujba and HaH237. Meteoritics & Planetary Science 38, A105. or the broader "Rock of the Month" Archives!